A Karnataka district that has been reeling under three successive years of drought may be bouncing back. The state government’s top bureaucrat in Bagalkote district led civil society groups in a water harvesting campaign between 16-27 June, just as the monsoon rains had begun. Shree Padre reports. Distressed by the severe drought but aware of the potential of RWH, Bagalkote District Collector K S Prabhakar planned a mass action. “Awareness and motivation are two necessities to make the public act”, he says. With this in mind, he opened Rain Centre, an information clearing house & training centre with a cost of eight lakh rupees. Long before all other DC’s started mentioning RWH, he had it installed in his official residence at Bagalkote town and his own house in Bangalore. “This gave me a lot of confidence. It is a solution for water shortage each one has in his own disposal. No dependence on others”, confides Prabhakar. Bagalkote falls is in a semi-arid region where the farming and farm labour are primary occupations for the people. Food crops are dominant; jowar is one of the rainfed crops here. Other crops are wheat, groundnut, green gram, and bengal gram. Cotton is grown in some parts. With the help of borewells, farmers grow pomegranates in Kaladagi village and nearby for export. Handlooms — saree and blouse piece weaving — provide good employment in the district. Ilakal sarees and Guledagudda blouse pieces are famous, but this sector is also is in a crisis. Drought conditions have forced lakhs of farmers to migrate as construction workers or farm labourers in other parts of Karnataka like the Mangalore region, where employment prospects are brighter and there is good rainfall. With a poor literacy rate (56%) and poverty, the media’s reach in the district is limited. But the villagers are stage-lovers and are participants in many professional and amateur drama troupes. Prabhakar made a key decision. He decided to utilize this form of art to spread awareness. The timing of jatha – 16-27 June – was perfect: the monsoon rains had just begun in the district. The jalajatha troupe planted few saplings in all the villages. Another laudable aspect is of their self-education and documentation. The troupes enquired and identified some success stories of RWH and traditional soil and water conservation practices and show-cased them. The team would visit the fields, witness and photograph such best practices. “The kind of initiatives and rain-catching cases we came across was really an exposure to me. I was of the opinion that no work was done in the district in this field”, confesses jalajatha director Prasad Kundoor of Niranthara Foundation. In each village, the troupe enlisted volunteers who wanted to harvest rainwater and would carry the torch forward, the jalyodhas. Many times, they had a hard time convincing the locals that this is not a government programme. As usual, the villagers were on the look out for subsidy. “You have seen that the subsidy route doesn’t bring you desired results. We are providing you low-cost methods to help yourselves”, Mudhol Tahshildar Shashikanth C. Gundakalle was heard re-iterating everywhere. The programme was not without drawbacks and the shortcomings. 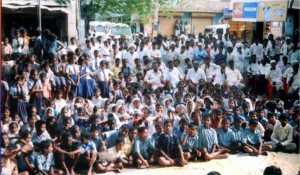 First and foremost, communities in the villages weren’t informed in advance about the correct date on which jalajatha would visit their village. In a few places politicians stole considerable time preaching while youngsters (students) were made to sit for long in scorching sun. But the necessity of water is such that people ignored such irritants. The procession culminated in a one-day training and inauguration of Maleneeru Sangha (Rainwater Organisation). The hall was packed with about 800 villagers. “The response is overwhelming. We haven’t given them transport facilities. All of them have come on their own. Our responsibility has increased; but we will fulfill it”, an enthused Prabhakar reacted. Prabhakar says that under the auspices of the Sangha, monthly experience sharing meetings (jalaanubhava mantapa) would be held. His office plans to bring out a directory of those who have already has success with RWH. Exposure visits to facilitate ‘seeing is believing’ would be another important activity. “We also propose to produce a video documentary on the successful drought-proofing methods and roof water harvesting success stories under the title ‘best practices'”, reels out Prabhakar. The first documented evidence of the existence of Bagalkot district dates back to the 2nd century CE, when the taluks of Badami, Indi and Kalkeri were mentioned in the works of the Greek astronomer Ptolemy. In the 6th century CE, the Hindu Chalukya rulers ruled over much of present South India. The Chalukyan king Pulakesi I established Bagalkote as his administrative headquarters; the district retained its prominent status until the Chalukyan empire was sacked by the Rashtrakutas in 753 CE. The Chinese explorer Hieun-Tsang visited Badami and described the people as “tall, proud,…brave and exceedingly chivalrous”. He estimated the kingdom to be approximately 1,200 mi in circumference. The rule of the Chalukyas of Badami, whose kingdom stretched from mordern Karnataka to Maharashtra and Gujarat was a highlight of Bagalkot’s history. Chalukya king Pulakesi II further consolidated the empire by battling with the Kadambas, Gangas, Mauryas of the Konkan, Gurjaras and Emperor Harshavardhana, whom he vanquished on the banks of the Narmada river  Accounts of war were inscribed on stone structures in the town of Aihole, now located in the taluk of Hungund. The Kalyani Chalukyas, descendants of the Badami Chalukyas conquered the area before the dawn of the 10th century CE. Their rule was intersperced with wars againsts the Cholas and Hoysalas. The Kalyani Chalukyas moved their capital from Badami to Kalyani, in the present day district of Bidar. Akkadevi, sister of the Kalyani Chalukya Jayasimha II ruled in the area for more than 40 years from 1024 CE. During the course of her rule of the area, then known as Kisukadu, seventy villages from Bagalkot district were added to her administration. The Chola king Vīrarajendra seized the area by defeating Somesvara I at Koodalasangama. By the 11th century CE, all of Karnataka including Bagalkot fell into the dominion of the Hoysala Empire, first consolidated by Veera Ballala and later subordinated to the Sinda kings. A Chalukya era stone carving of the Hindu God Shiva in the taluk of Badami. The Yadavas of Deogiri annexed Bagalkot in 1190 CE and ruled until approximately the thirteenth century. The Deccan invasion by the Muslim Khilji dynasty, lead by Ala ud din Khilji in 1294 brought an end to the rule of the Yadavas. In the 14th century, much of this territory was overrun by the Muhammad Taghlaq. That the Taghlaqs were undisputed overlords of this territory cannot be established since Harihara, first king of the Vijayanagara Empire is supposed to have possessed territories as far north as Kaladgi in 1340 and because a fort was built under permission from Harihara in Badami during that time period. In the late 15th century, the Adil Shahi dynasty founded by Yusuf Adil Shah established an independent state with Bijapur as its capital. It is from this time that Bagalkot’s history is homogenous to that of Bijapur’s. In 1818, after having lost their kingdom to the British, the Maratha Peshwas of Satara were crowned underlords of the kingdom. With the failing of their brief reign which ended in 1948, the district passed into the hands of the British Raj and was incorporated into the dominion of the Bombay Presidency. According to the 2001 census of the district, the towns of Bagalkot and Badami each had a population of over 100,000. Kannada is the primary language in the district. Approximately 88% of the district’s population was Hindu, while 11% was Muslim. In September 1901 a famine swept through the district, particularly affecting Indi, Sindgi and Badami taluks. India gained independence from the British in 1947; thereafter, the States Reorganisation Act of 1956 allowed for the creation of a Mysore State, renamed Karnataka in 1971, and for Bijapur (and therefore Bagalkot) to be included in its dominion. A separate district of Bagalkot was carved out from the existing Bijapur district in 1997. The annual Badami-Banashankari Jaatre sheds light on the culture of the people of Bagalkot district, writes Shrinivas Nargund. Bagalkot district boasts of many places of cultural and historical importance and has contributed a lot to the fields of art and culture. Many cultural events and jaatra mahotsavas are held here at regular intervals.The Badami-Banashankari Jaatre (fair) is one of the most important religious and cultural fests held here. Badami, the capital city of Chalukyas, is 35 km from Bagalkot and is not only known for its cave temples (Mena Basadi) and other historic monuments but also for the Banashankari Devi Temple, which is at a distance of about 5 km from Badami. The attractive statue of Goddess Banashankari in the temple, sitting on a lion, also known as Shakti Devi, Shakhambari and Banadevi, is revered by people from all over. The Banashankari Devi Jaatre, which throws light on the cultural aspects of the people of this region, is celebrated once a year for three weeks with pomp and grandeur. The car festival or the rathotsava of Goddess Banashankari Devi is held on Banada Hunnime every year and thousands of people, irrespective of their caste and creed from across the State and surrounding villages come in colourful carts to witness this cultural and religious event. The actual religious programmes that mark the fair begin from Bandasthami. Palleda Habba or the Vegetable Utsava is a unique part of the fair when many vegetables are offered to the Devi as naivedya. Another attraction of this fair is Teppotsava when parents blessed with children by the grace of the Goddess take their new borns on a teppa (small cradle made up of banana stems) around the pond (honda) in front of the Banashankari temple which is almost dry now. Women vendors from nearby villages selling rotti and mosaru (roti and curds), accompanied by badanekai palle (brinjal bhaji), kaal bhaji, etc. are almost always near the temple. The tonga ride from Badami to Banashankari temple is enjoyable with greenery and strange rocks on either sides of the road. Hundreds of monkeys, popularly known as ‘Badami Mangya’, have a good time snatching eatables from tourists! Hundreds of stalls selling domestic articles, agricultural equipments and big wooden door frames are a major attraction at the fair, as also the many drama and cinema tents that offer entertainment to the people. Cattle fair also forms a part of the three-day festival. The then Mysore Government had conducted a folk songs competition to encourage people in the field of arts and noted art troupes led by Yenagi Balappa, Kandagal Hanumantraya and Gangadhar Shastri had come here to present dramas, recall elders of the place. They also add that noted artistes like Dr Rajkumar, G V Aiyar, Balakrishna, Narasimha Raju and Pandharibai had performed dramas in the late 60s. Various government departments too conduct awareness programmes of their respective fields during the jaatra mahotasava.